"Chakchouka (also called shakshouka) is a Tunisian and Israeli dish of tomatoes, onions, pepper, spices, and eggs. It's usually eaten for breakfast or lunch, but I think it's tasty anytime. And it's easy to make. 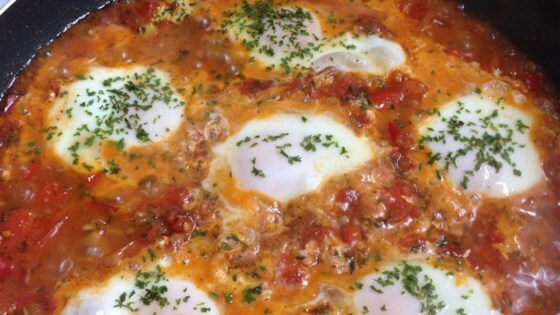 It is similar to the Turkish dish 'Menemen' and to the Latin American breakfast dish 'Huevos Rancheros.'" Heat the olive oil in a skillet over medium heat. Stir in the onion, bell peppers, and garlic; cook and stir until the vegetables have softened and the onion has turned translucent, about 5 minutes. Combine the tomatoes, cumin, paprika, salt, and chile pepper into a bowl and mix briefly. Pour the tomato mixture into the skillet, and stir to combine. Simmer, uncovered, until the tomato juices have cooked off, about 10 minutes. Make four indentations in the tomato mixture for the eggs. Crack the eggs into the indentations. Cover the skillet and let the eggs cook until they're firm but not dry, about 5 minutes. You may use drained canned tomatoes instead of fresh, if desired. This came out wonderful. I love savory breakfasts and this really hits the spot! I multiplied by about 10 and used 36 eggs. Our staff really enjoyed it. Thank you! Wasn't bad. Had leftovers for breakfast the next day. As a dinner, would be better served over a carb such as rice or mashed potatoes, I think. Delicious. I made it exactly as written. Wish I had thought to buy pitas, but serving it with toast was still really good! Having recently returned from Israel, I was delighted to find this recipe. I added a 1/3 cup of sliced green olives. It was delicious! Wow. A recipe that is tasty, easy, quick, DELICIOUS, cheap, healthy, and has easy clean up? Pinch me. I have to be dreaming.